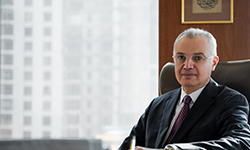 Amr obtained his LLB from the Faculty of Law at Alexandria University in 1984 and joined the firm during the same year, and has now acquired over three decades of experience. He has been a partner at the firm since 1991. Amr was admitted before the Egyptian Court of Cassation in 2001. Today, Amr serves as the Managing Partner of the firm. He primarily represents multinational banks and corporations in the region and provides legal advice regarding matters of banking and corporate work including mergers & acquisitions, transactions, drafting & negotiating transaction agreements, due diligence procedures, shipping law, intellectual property litigation, as well as general company law advice relating to corporate governance and procedural matters. In the practice of Intellectual Property, Amr is recognised for his well-thought and comprehensive advice to brand owners on anti-counterfeiting and enforcement of intellectual property rights issues. He also assists them with negotiating and drafting license and franchise agreements as well as with legal issues including cancelation actions, infringement and unfair competition cases. Additionally, Amr has an extensive database of clients in the field of Maritime law. He’s handled some of the largest shipping incidents related to collisions and pollution. Amr is a member of the Egyptian Bar Association, International Bar Association (IBA), International Law Association (ILA), Association Internationale Pour la Protection de la Propriété Industrielle (AIPPI), International Trademark Association (INTA), American Chamber of Commerce in Egypt (AmCham), Egyptian Belgian Business Association, Egyptian Maritime Society, and a board member at the Egyptian Association for Protection of Industrial Property (AEPPI).